Galaxy Quest is a 1999 science fiction comedy film written by David Howard and Robert Gordon and directed by Dean Parisot. It stars Tim Allen, Sigourney Weaver and Alan Rickman and features Tony Shalhoub, Sam Rockwell, Daryl Mitchell, Missi Pyle and Justin Long in his feature-film debut. The original music score was composed by David Newman. The movie, a parody inspired by the television series Star Trek, is about the washed-up stars of a fictional 1978–1982 TV series called	Galaxy Quest. On the show, the actors played the crew of a spaceship, the NSEA Protector and embarked on "intergalactic adventures", but then they are recruited by aliens who believe that their fictional adventures were real. Portions of the movie were filmed in Goblin Valley State Park, Utah, USA. Galaxy Quest won the 2000 Hugo Award for Best Dramatic Presentation. 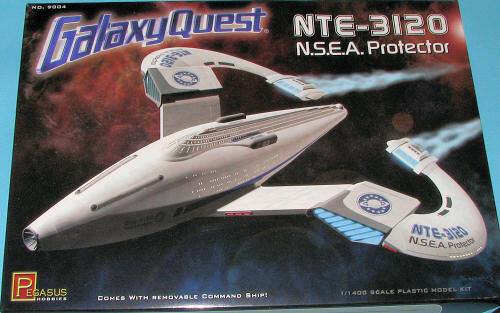 Finally someone has done a model kit of the NSEA Protector and it has been Pegasus Hobbies. Pegasus had brought to us a number of nicely done sci-fi kits, all of them in an EZ-build form. Though these are allegedly aimed at the younger modeler, it is the older one that, at least locally, seems to be the ones buying it. The local hobby shop had sold out of their stock within a week of receipt. The kit has 40 parts which includes a display stand. The alignment pegs and holes are quite large and should make assembly easy, though filler will be on the list of things to have to take care of the admittedly large joins. 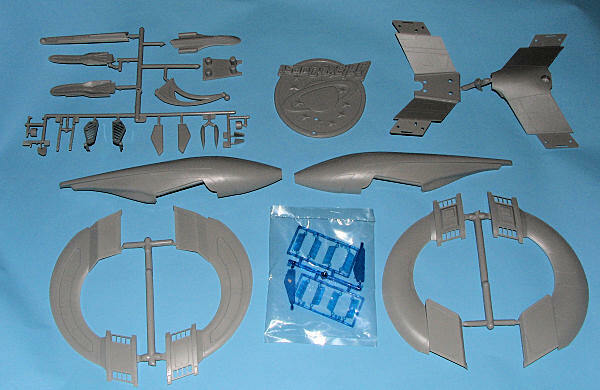 There is a sprue of blue plastic for the engine intakes. The fit of these into the 'wings' is such that a wise modeler will be doing some pre-painting before assembling these, as masking after the fact may prove to be a bit of a chal lenge. The small upper 'command ship' is a separate item that is not designed to be glued in place. However, I'm sure that most of us will do just that. The display stand is quite sturdy looking and will look great once painted. The kit includes four magnets. Two are to be put into the command ship and two in the area where it attaches to the main ship. Due to an oversight, the instructions say nothing about these magnets, but that is their purpose. The kit's instructions are well done in 9 steps. Color information is by generic colors with no FS 595 references. Apparently this kit is ABS plastic as there is a warning not to use MEK based glues; Tamiya extra thin cement being the preferred glue. There is a decal sheet provided which is fairly well printed and from past experience, they work well. Overall, it looks like it will be a fun build. I've enjoyed the few kits I've built from this company and expect this one to be equally enjoyable. Thanks to me and my penchant for the unusual on this one.